Nuri Şahin was voted the best player of the first half of the Bundesliga season by his fellow players and he is the favourite to win the overall player of the year award. In this post I take a closer look at his passing using statistics gathered from the official Bundesliga website. Şahin has been one of the most active passers in the league, as far as I can tell only Bastian Schweinsteiger and Philipp Lahm have attempted more passes. With 1803 total passes he has attempted almost 400 more passes than any other Dortmund player, and adjusted for playing minutes he has contributed 14.9% of Dortmund’s total passes, which puts him up there with the likes of Cesc Fabregas and Paul Scholes in terms of what percentage of a team’s passes a player contributes. On average Şahin completed 47/62 passes per 90 minutes. 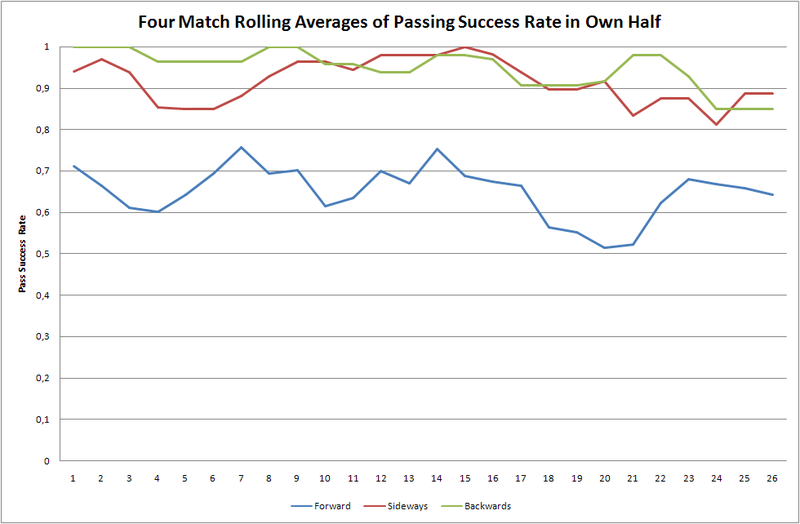 For the above graph I took the four match rolling averages of successful and attempted passes to see how those figures have fluctuated over the season. As you can see both have stayed roughly constant, his successful passes fluctuating between 40-50 and his attempted passes between 55-70. 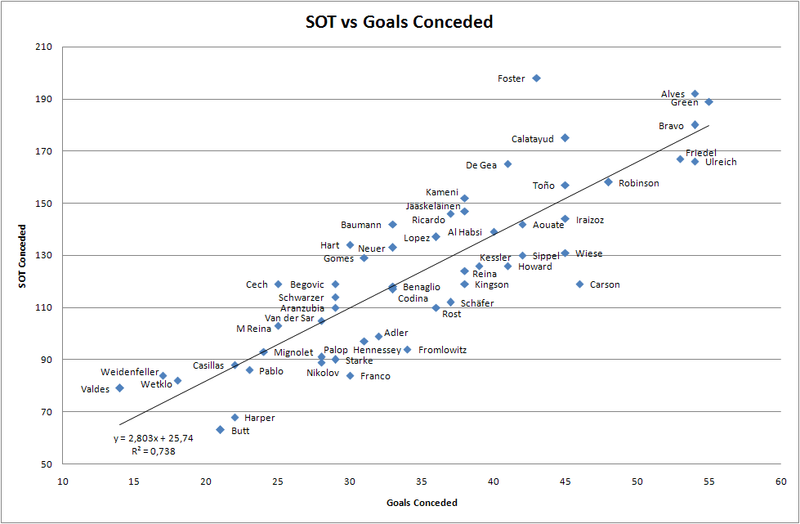 Note that in this and in all future graphs I omitted his last match against Freiburg because he only played 28 minutes. To get a more accurate sense of his passing I separated his passes into forward, sideways and backwards passes both in the opponent’s half and his own. Of his passes 49.6% were in the opponent’s half, 50.4% in his own. 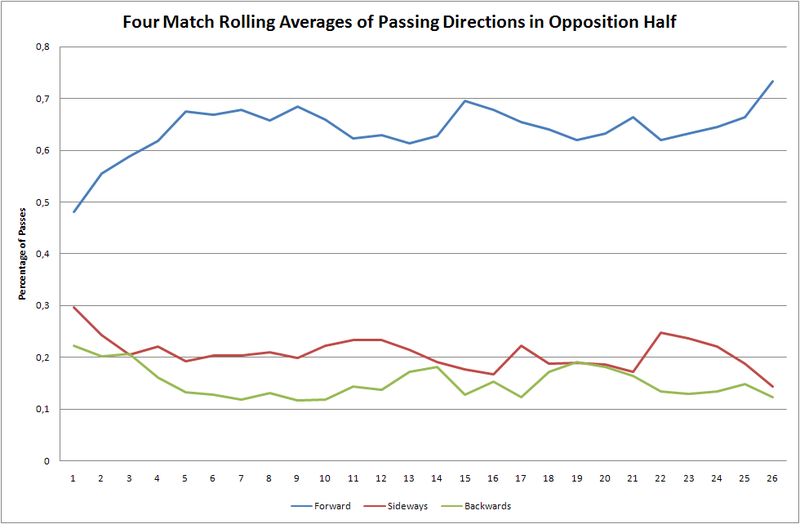 Of his passes in the opponent’s half 63.8% were forward passes, 20.9% sideways passes and 15.3% backwards passes. 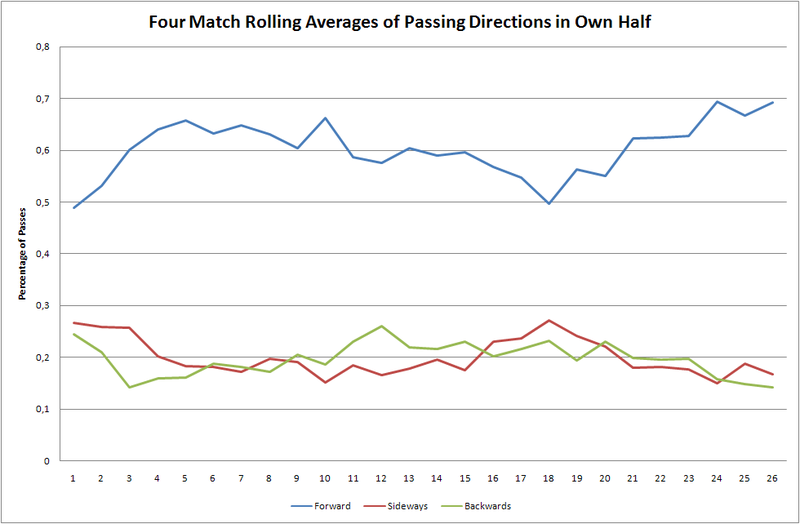 Of his passes in his own half 59.1% were forward passes, 20.2% sideways passes and 20.7% backwards passes. 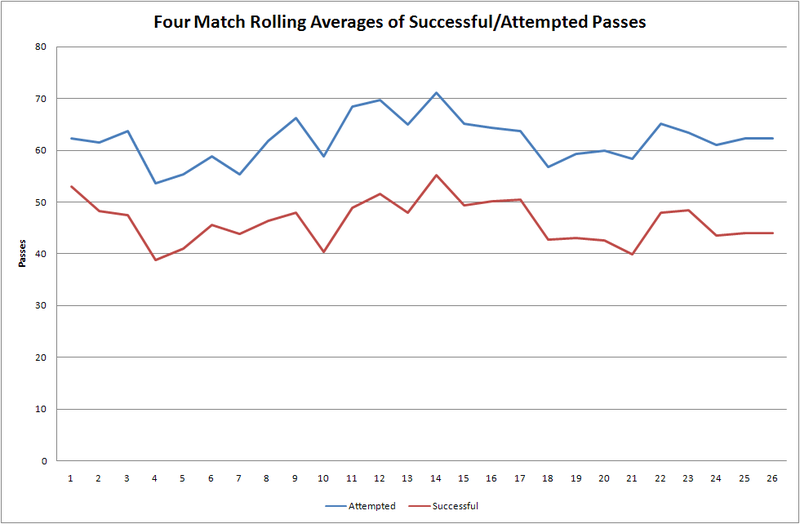 To look at how those numbers fluctuated over the season I again took the four match rolling averages. 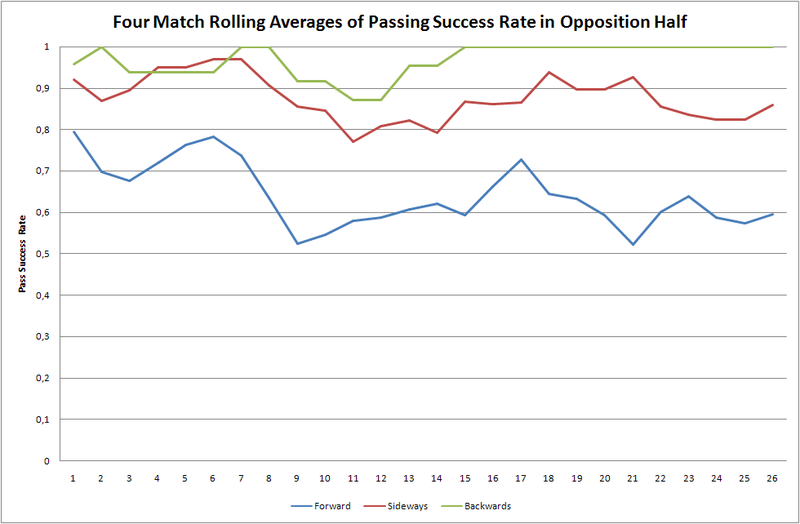 After an early increase in his percentage of forward passes both in the opponent’s half and his own, and a corresponding small dip in the percentage of sideways and backwards passes, his passing direction percentages stayed roughly constant until there was another small increase in forward passing in his last few matches. It is clear from these graphs that he is not content to simply pass the ball sideways and backwards, instead he looks to play the ball forward whenever possible. The accuracy of his different passes and the total number of successful/attempted passes of each kind are summarised in the following table. The graphs show the fluctuation over the season. According to the data he misplaced about one-third of his forward passes. While this is an area he could look to improve it is not necessarily a bad thing. From watching almost every match he has played this season I can say that his first instinct is always to look for the ambitious, forward option, and for a playmaker this is a good thing because the way you create chances is not by playing it safely, it is by taking calculated risks and playing those difficult but potentially highly rewarding passes. The most creative players and the players with the highest assist counts often have below average attacking third pass completion rates and as long as Şahin is creating a lot of chances it seems to me like his lower pass completion rate is a trade-off worth making. So does he create a lot of chances? Yes, he absolutely does. His 3.61 key passes per match is not only best in the league but according to the data from WhoScored.com also the best in any of the top five European leagues. Below are lists of the top chance creators in the Bundesliga and in all of Europe. So far I have only discussed Şahin’s passing in open play but he also takes corners and free kicks. This season Şahin has taken 114 corners of which 6 were taken short. Of the 108 that were delivered straight into the penalty area 41 found a teammate, a success rate of 38.0%. He also took 86 free kicks of which 72 were crossed into the penalty area. Of those 27 found a teammate for a success rate of 37.5%. Combining his corners, free kicks and crosses from open play overall he delivered 211 crosses with a success rate of 37.4%. In a future post I may look at his shooting, dribbling and defensive work, but for now hopefully this post has provided some insight into what kind of player, and specifically what kind of passer, Nuri Şahin is.